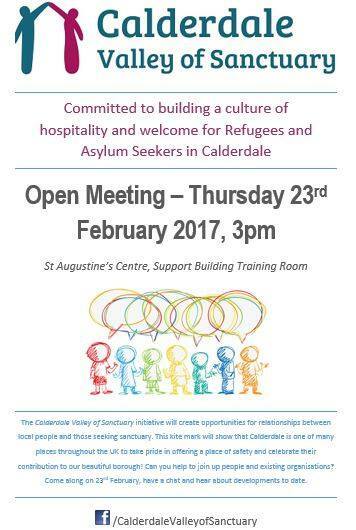 A friendly reminder that the next Calderdale Valley of Sanctuary meeting will be on Thursday 23rd February, 3pm at St. Augustine’s Centre Halifax. Please send us a message to confirm attendance. The Calderdale Valley of Sanctuary initiative will create opportunities for relationships between local people and those seeking sanctuary. This kite mark will show that Calderdale is one of many places throughout the UK to take pride in offering a place of safety and celebrate their contribution to our beautiful borough! Can you help to join up people and existing organisations? Come along on 23rd February, have a chat and hear about developments to date.